In the opening months of the First World War, the German army advanced at such speed that Allied forces were left stretched at the front. It is often argued by historians that, had the Indian army not arrived when it did, the Germans would have reached the English Channel ports. 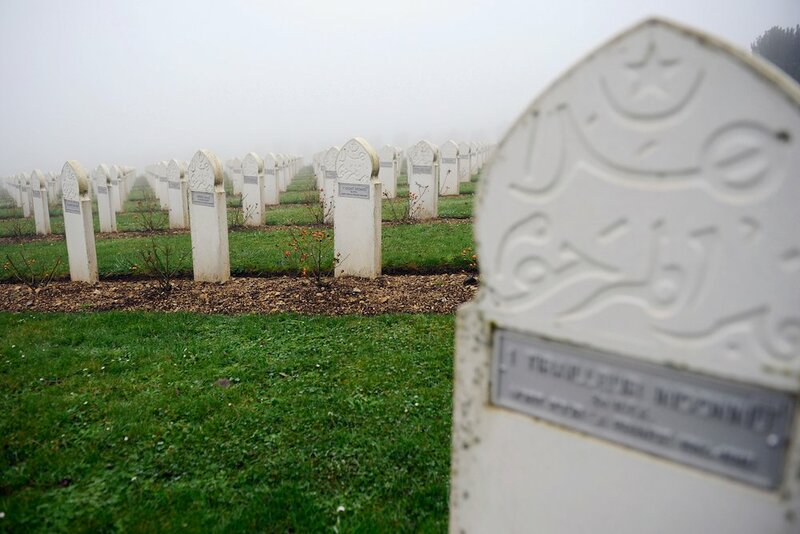 Last week, as the world stood still in remembrance on the centenary of the armistice, the contribution of some 1.5 million Muslims to the Allied war effort is often overlooked. With rising anti-Muslim sentiment noticeable across Europe today, it is important to recognize the scale of their valiant contribution to European history and security. Estimates of the number of Muslims who supported the Allied war effort range from 800,000 to 2.5 million. Some 400,000 of these hailed from the British Indian Army — incidentally the largest volunteer force in history. Joined by 200,000 Algerians, 100,000 Tunisians, 40,000 Moroccans and tens of thousands from elsewhere, their contribution continues to remain but a footnote in the historical record. With unprecedented casualties being inflicted on national standing armies, entire theaters of what was the first truly international conflict were staffed with colonial troops. The four-year, hot and bloody Mesopotamia campaign was almost entirely fought by the British Indian Army. Some 588,717 Indians served in the campaign, importantly routing the Turks from what is now Iraq and securing critical petroleum supply routes in the process. The war intensified as the Imperial German Army embarked upon “gericht” (judgment) and planned to “bleed France to death,” according to the orders of Gen. Erich Von Falkenhayn. As French forces struggled to defend Paris, the Germans were just 40 miles away in some cases. But Muslim troops greatly supported the war effort. Of all the French colonies, Algeria represented the largest supplier of material resources and manpower for France, along with West Africa. Since the French had not instituted obligatory military service in Morocco, whose troops ostensibly fought for their sultan, or in Tunisia, where conscription was instituted under the bey, Algeria made up the bulk of recruits. As the war dragged on, French methods for recruitment became more involuntary, resulting in revolts in the east of the country, which were put down violently by Gen. Deshayes de Bonneval from October 1916 to the spring of 1917. In any case, young North African men continued to fill the ranks. Seeing their colonial masters in dire straits, many Muslim soldiers who had fought in the war returned with national independence on their minds. At first, ill-trained colonial troops were used as cannon fodder whilst new British and French recruits were trained. However, as the war entered its third year and they had greater battle experience, they were increasingly the subject of praise. Whether in the Artois, on the Somme, at Verdun or at Chemin des Dames, regiments of Algerian infantrymen and Moroccan Goumiers were among the most praised and decorated during the war. In the British Army, several Indian soldiers showed extreme bravery (often to the point of recklessness) and loyalty, with several attaining the Victoria Cross, Britain’s highest military distinction. The striking bearded and turbaned figure of Khudadad Khan is probably the most famous. A Punjabi subedar serving in the 129th Duke of Connaught’s Own Baluchis, he was awarded the medal for gallantry in the face of the enemy. A machine gunner dispatched to support exhausted British troops, his division was outnumbered five-to-one, but they fought until they were completely overrun. Khan, wounded, continued to gun down enemy soldiers until he was the sole survivor from his regiment in that battle. He feigned death and later crawled back to his lines under cover of darkness. The bravery of Indians like Khan is credited with halting the German advance to the key strategic ports of Boulogne in France and Nieuwpoort in Belgium. The First World War was a conflict of unparalleled horrors, especially for the millions of young men who laid their lives on the line for the Allied war effort. Finding themselves on foreign fields, freezing and poorly equipped, the bravery they showed fighting for a cause which was not their own is commendable. At Villeroy, Moroccan soldiers stunned Allied officers with their treatment of prisoners of war and, when asked why they behaved with such courtesy, explained that, according to the examples of Prophet Muhammad, prisoners must be cared for and fed. Such loyalty and dignity was their combined contribution — an especially important legacy as no veterans of the Great War remain. The experience of war had a lasting impact on the relationship between European empires and their Muslim subjects. Seeing their colonial masters in dire straits, many Muslim soldiers who had fought in the war returned with national independence on their minds. In France, there had been fewer than 15,000 Algerian workers in 1914, but by 1918 there were 120,000. As some 4 million call France their home today, this is perhaps the longest shadow of the contribution their forefathers made to France’s continued independence.